Austin Film Festival; October 13 - 20, 2016. Known as “The Writer’s Festival” since its inception, the Austin Film Festival celebrates films built on strong storytelling. AFF recognizes the importance of the creator at the core of filmmaking and screens the highest caliber narrative, documentary, and animated films — all of which demonstrate the power of a well-told story. Submit your documentary to Austin Film Festival! 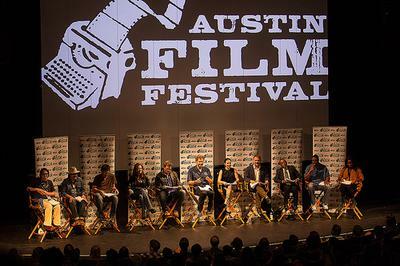 Austin Film Festival is now in full swing and we want to see your documentary feature or short. We’re looking for docs that inhabit a solid narrative structure and relay a fully-formed and impactful story. We’re excited to announce our Documentary Short winner will be eligible for an Academy Award. In addition, we will have industry A-listers serve on our Documentary feature jury, such as P.O.V. and Oscilloscope Laboratories’ representatives. The prize will be $2500 for the Documentary Feature and $1000 for the Documentary Short, in addition to reimbursement of one round-trip airfare and stay in Austin, Texas during the festival. That’s not to mention the attention and press you’ll get for screening your film at AFF. Each year multiple documentaries go on to find distribution. Austin Film Festival furthers the art and craft of filmmaking by inspiring and championing the work of screenwriters, filmmakers, and all artists who use the language of film and television to tell a story. In addition to an 8 day film festival and 4 day Conference, we offer Year Round Events, a Young Filmmakers Program, a TV show, Radio show, Podcast and more! AFF provides filmmakers an invaluable platform among industry professionals and film-lovers. Offering A-list jurors, amazing venues, and an opportunity to network and learn, Austin Film Festival is the place to be this October. All of AFF’s juried categories—Narrative Features, Documentary Features, Narrative Shorts, Student Shorts, Animated Shorts, Dark Matters, Documentary Shorts, and our brand new category, Comedy Vanguard—have cash awards. In addition to the competitions, all submissions will be eligible to screen out-of-competition in special sections such as the Texas Independents Series. On top of all that, the winning films in the Narrative Short, Documentary Short, and Animated Short categories are Academy Award®-eligible!